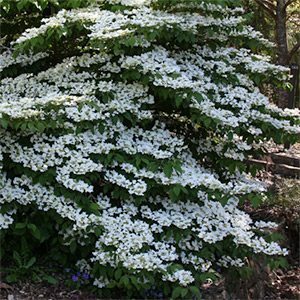 One of the really graceful Viburnums, is Viburnum plicatum Lanarth. 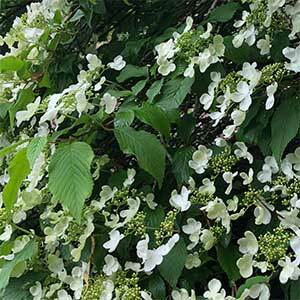 A naturally graceful tiered growth habit, textured foliage and masses of white flowers in spring. This species is from China and nearby areas, widely grown in Japan as well as Taiwan. A very easy care shrub that will flower well in part shade. Viburnum plicatum Lanarth is at home near a water feature, as a feature plant in a lawn, or at the front of the garden border where it is allowed to flow over the edge of a path or lawn. In autumn, Viburnum plicatum Lanarth puts on a show of purple foliage. The flowers which appear in spring may give way to red berries that age to a deep purple. The flowers form on the horizontal branches, so this gives is a clue as to how to prune. Remove the unneeded verticals. best grown in a humus rich soil that is well drained. Once established this is a relatively drought tolerant. We do suggest watering as required over the first few summers. Fertilise in late winter to early spring by top dressing with well rotted compost and some aged cow manure, a general purpose slow release fertiliser can also be used. Selective pruning of branches after flowering can help to maintain a good shape.